The dark, icy, dwarf planet Pluto is undergoing seasonal changes due to its highly elliptical orbit. NASA has released some dramatic pictures taken with the Hubble Space Telescope that clearly show differences over a two year period. Considering that Pluto takes 248 years to orbit the Sun, astronomers were not expecting to find such obvious alterations to the surface structure over so short a period. It would be equivalent to the whole appearance of the Earth's surface changing in only 72 hours. The Hubble pictures confirm Pluto is a dynamic world that undergoes dramatic atmospheric changes and is not simply a ball of ice and rock. These dynamic seasonal changes are as much propelled by the planet's 248-year elliptical orbit as by its axial tilt. Pluto is unlike Earth, where the planet's tilt alone drives seasons. Pluto's seasons are asymmetric because of its elliptical orbit. Spring transitions to polar summer quickly in the northern hemisphere, because Pluto is moving faster along its orbit when it is closer to the Sun. "The Hubble observations are the key to tying together these other diverse constraints on Pluto and showing how it all makes sense by providing a context based on weather and seasonal changes, which opens other new lines of investigation," says principal investigator Marc Buie of the Southwest Research Institute in Boulder, Colorado. 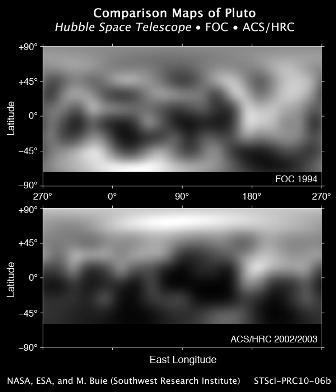 The Hubble images surface variations a few hundred miles across that are too coarse for understanding surface geology. But in terms of surface color andd brightness, Hubble reveals a complex-looking world with white, dark-orange, and charcoal-black terrain. The overall color is believed to be a result of ultraviolet radiation from the distant Sun breaking up methane present on Pluto's surface, leaving behind a dark and red-carbon-rich residue.